Whenever I go to a café for breakfast it is almost guaranteed that I will order Eggs Benedict, especially if it has spinach. It's definitely my all-time favourite breakfast. Here's a recipe! Whisk together the lemon juice and egg yolks in a heatproof bowl. Place bowl over a saucepan of simmering water using a low heat. Whisk until the mixture becomes thick and pale. Add 1 cube of butter and whisk until melted. Repeat until you have used the remaining butter. Remove from heat, season with salt and pepper and set aside. Heat a frying pan to a low heat then wilt the spinach. Meanwhile, cut your English muffin in half and toast. 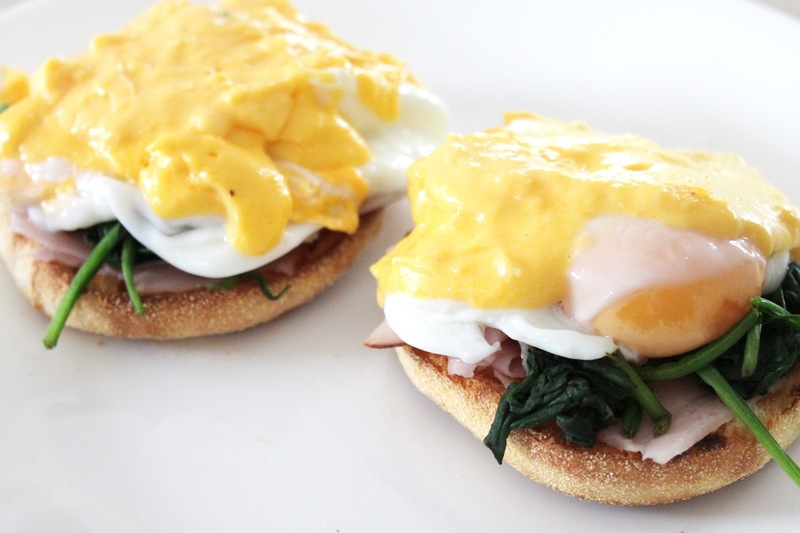 Top your English muffin with the spinach and ham. Fill a saucepan two-thirds full with water. Bring to the boil and then reduce to a medium low heat. Stir the water to create a whirlpool. Break an egg into a small bowl then place gently into the whirlpool. Allow to cook for 3-4 minutes. Do not stir. Place onto one half of the English muffin. Repeat steps 5 and 6 with the second egg. 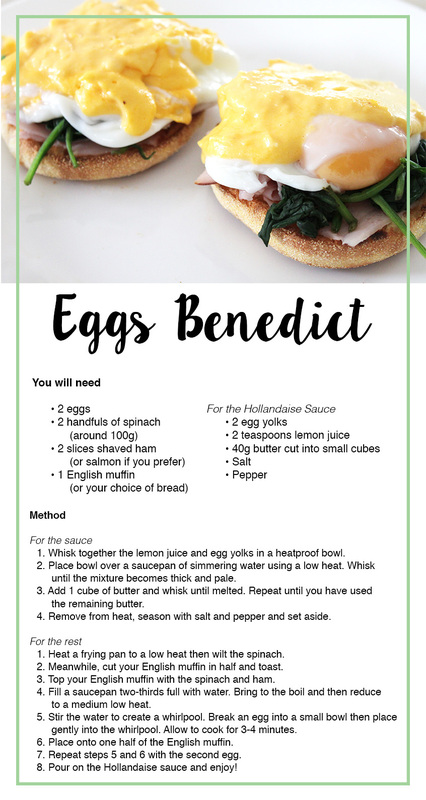 Pour on the Hollandaise sauce and enjoy! If you love savoury breakfasts as much as I do you'll want to give this one a go. Try it this weekend! You can even make some cheeky meringues with the leftover egg whites. i don't even eat eggs but this looks so good!